With Windows 10 Mobile, there's almost always more content on-screen, and there are finer fonts to help with this, which work especially well on the 1080p (and above) screens. 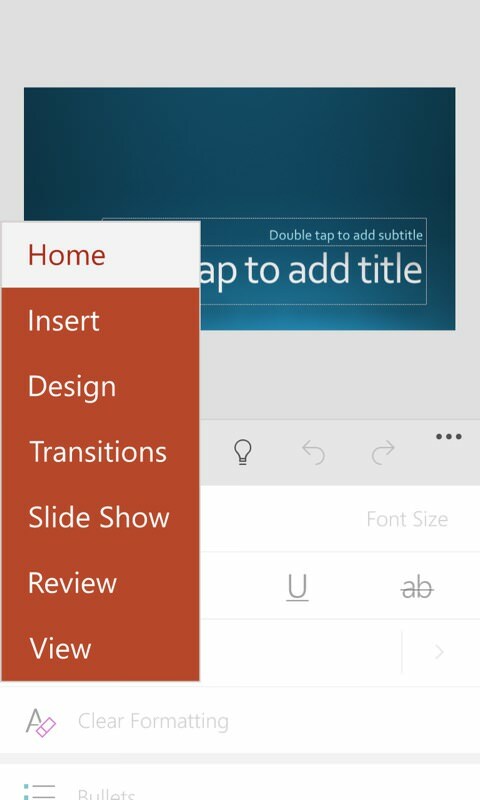 Of course, Windows Phone traditionalists will point out that the switch in UI has also brought a few backward steps in usability, at least when thinking about one-handed use, but bit by bit I've seen Windows 10 Mobile improve in this regard too, and it's rare not to have most of what you need somethere within reach. I'm confused why many die-hards are bemoaning the loss of 'HERE Maps' (etc.) 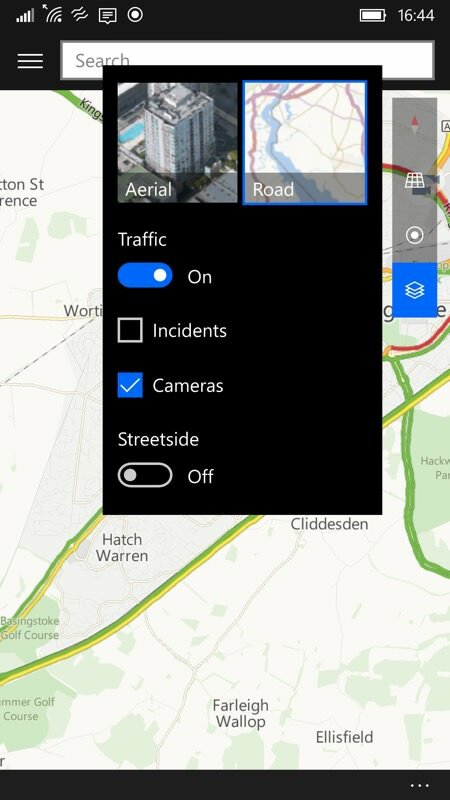 on Windows 10 Mobile, since a) Much of the core functionality in Windows 10 Maps was based on HERE Maps, adding new functions such as live traffic and cameras, integrated transit data, and so on; b) the map data for most countries is still the same HERE dataset, that company remains by far the dominant map provider; c) HERE, now no longer owned by Nokia, lost interest in programming for Windows Phone and Windows 10 Mobile a long time ago - at least Microsoft seems keen to keep the application bang up to date. 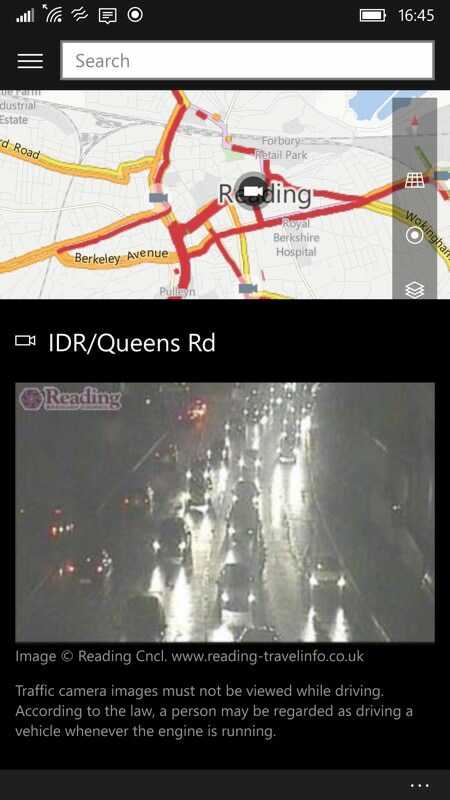 It's not perfect yet - I'd like to see larger and thicker fonts in the UI and I'd like to see real time re-routing based on traffic conditions, but it's a lot better than the HERE suite in my opinion. 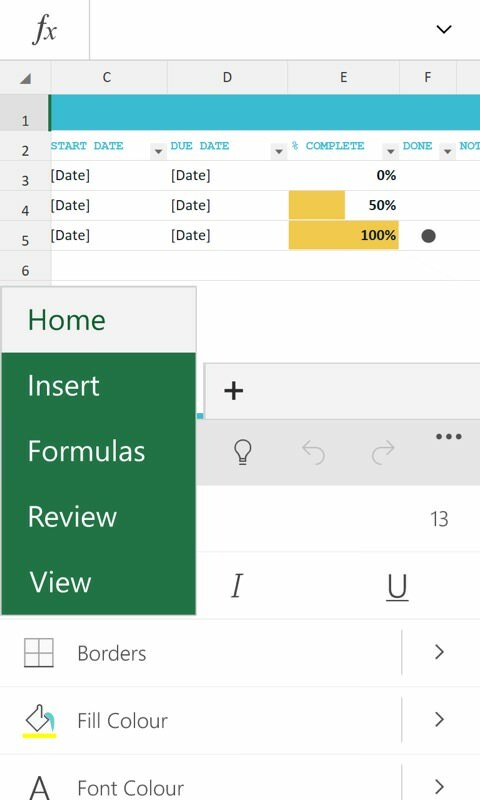 One of the seven wonders of the tech world is that the full Office application - and I mean the full app (at least in the 'modern UI' variant) has been shoehorned into Windows 10 Mobile. Just about everything that you might do on, for example, a Surface device, can also be accomplished for free on a Windows 10 Mobile upgraded device. So making edits to a company spreadsheet or PowerPoint presentation, for example. With Office under Windows Phone 8.1, compatibility and functionality were both severely limited. Admittedly this came in for Windows Phone 8.1 Update 2, but the implementation was flawed and in any case only a tiny fraction of phones got this update. Bluetooth keyboards work really well with Windows 10 Mobile. In particular, in conjunction with no. 5 above, it's quite practical to hook up, but your phone in landscape mode and type away, finishing a report, say, or catching up with a volume of emails, while you have the full screen available for content. Add a Bluetooth mouse as well, hook up to a Miracast-compatible display and you've got 'Continuum lite'. Maybe. Article coming soon! Nestled in the bottom left of the Windows 10 Mobile keyboard is a control completely inspired by the IBM 'Pointing Stick' on the classic ThinkPad laptops. Nudge/drag it right and the cursor is nudged right by one position, ditto for any other direction, or drag and hold and the cursor starts shuffling along. It's a surprising addition to the UI but one which proves very useful in day to day life, fixing tweets and adjusting short emails without having to tap multiple times in text to try and get the cursor insertion point perfect first time. The backup system under Windows Phone 8.1 was a little hit and miss, but did work acceptably when pushed. For Windows 10 Mobile, the rough edges have been polished off and you also get better transparency as to when a backup happens and how large it is (on Microsoft's servers). 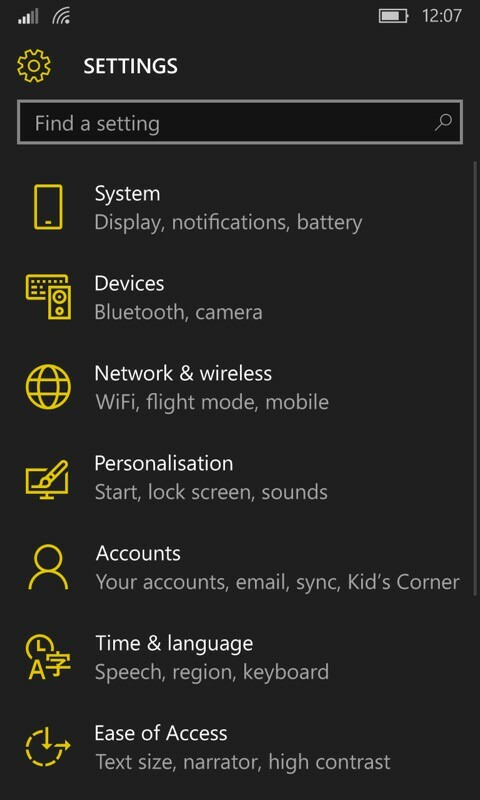 I've had cause to reset and restore Windows 10 Mobile set-ups numerous times now and just about everything came back, even some login and settings data within individual applications. Almost every application in Windows 10 Mobile works just as well in landscape mode as in portrait, thanks to the way Windows 10's interface is designed to work on tablets and laptops too. Working this way often gives a better view of whatever you're doing, especially if you're using (e.g.) a Bluetooth keyboard too. 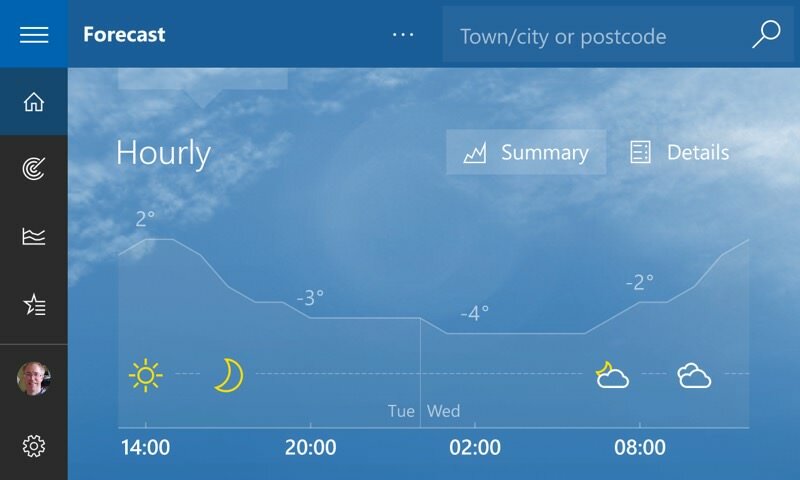 The only notable exceptions are the Start homescreen itself - odd, because the live tile system works very happily in landscape on tablets - and Cortana - again, surely something Microsoft will tweak in the future. All in all, useful overall though. 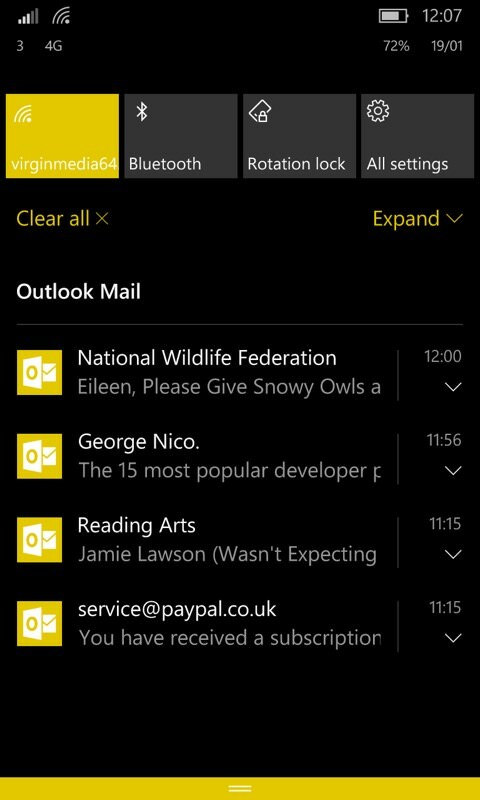 Now with a dark theme (on my AMOLED-screened devices), I'm growing to appreciate the full functionality of Outlook's two big modules. And I'm only a home user - I imagine that in an Office and Outlook-dominated business environment, the use of the full Outlook Mail and Calendar are wonderfully familiar. 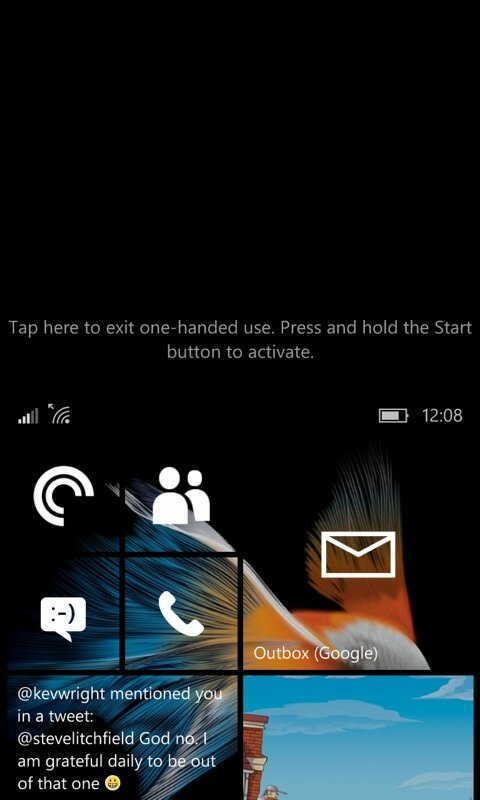 Action Center got bumper up on steroids for Windows 10 Mobile, with an extra swipe down popping up sixteen toggles and shortcuts, somewhat reminiscent of that in stock Android - importantly, this includes an integrated flashlight (using the LEDs on the back), shortcuts to OneNote and Camera, and toggles for mobile data and mobile hotspot. Meaning that there's probably no need to head into Settings on a daily basis anymore. You can configure the 'bottom four items too, the ones that appear in the Action Center 'overview'. Really well done all round. 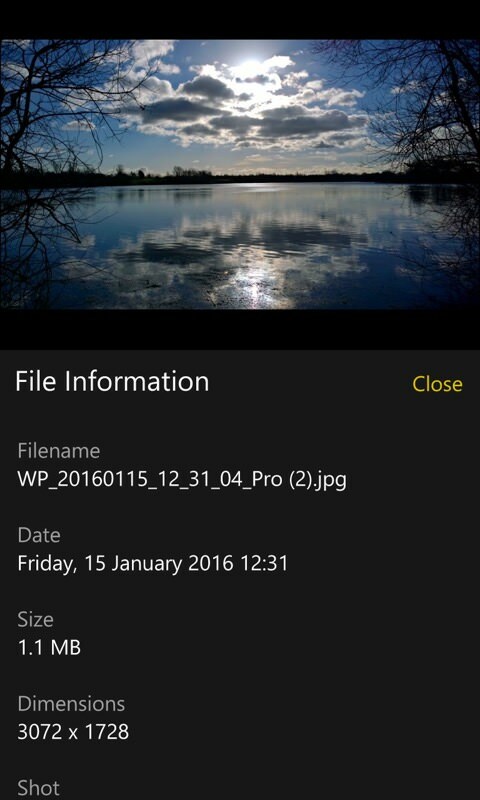 Talking of Settings, it's finally sorted properly in Windows 10 Mobile, hierarchically arranged and much faster to use. OK, so it was also sorted better for 8.1 Update 2, but that was only ever on a tiny fraction of Windows Phones, so for most people the Windows 10 Settings application will be a revelation. Especially so if they also use Windows 10 on the desktop, the hierarchy is almost identical. Something of a gimmick on sub-5"-screened phones, but more useful on phablets like the Lumia 950 XL and on an upgraded Lumia 1520 and 1320, a long press on the Start control slides down the display so that you can interact quickly, one-handed, with the top half of the touchscreen. Although Windows Phone 8.1 supported 'Universal' applications, the way Windows 8.1 on the desktop was so unloved mean that there was never much interest from developers in getting their applications into the ecosystem. Windows 10 is a massive success so far on the desktop (thanks, mainly, to it being a free upgrade) and universal applications are arriving daily in the Windows Store. Most of which work equally well on Windows 10 Mobile phones (and often 8.1 as well) so Microsoft's vision does seem to be paying dividends. Yes, there are a number of high profile social applications which are missing in action (thanks to their developers hating Microsoft, usually), but things are rosier than for a while. One fundamental aspect of Windows 10 is that the text elements of the user interface can be adjusted to suit the user's eyes. And this works on every device. 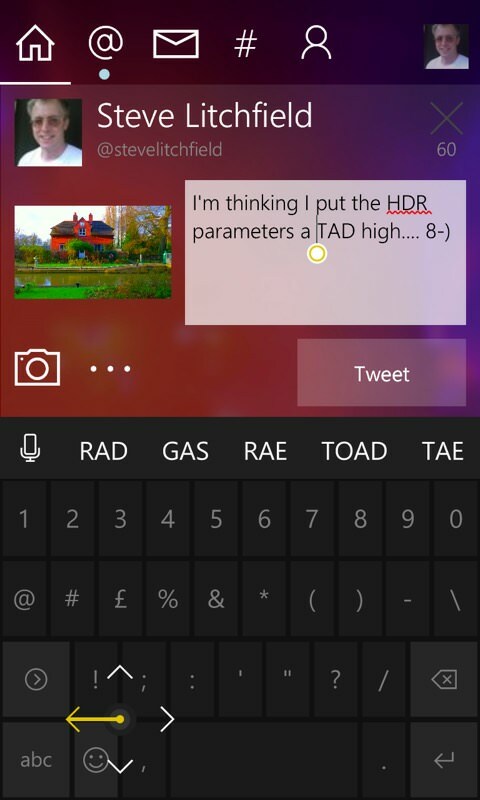 Now, the Microsoft defaults are set sensibly on a device by device basis, but it's fun to fiddle. 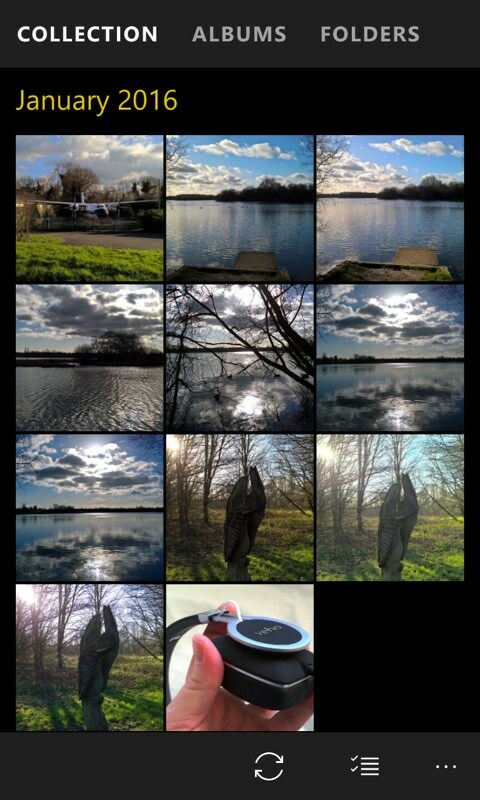 Admittedly you have to restart the phone to see the effect of any changes, but at least it's all possible. My only complaint is not all the other UI elements scale in the same way - there's not much point in having tiny text in large empty UI boxes, for example. Comments welcome. A compelling set of improvements all round and for most people the future of 'Windows Phone'. 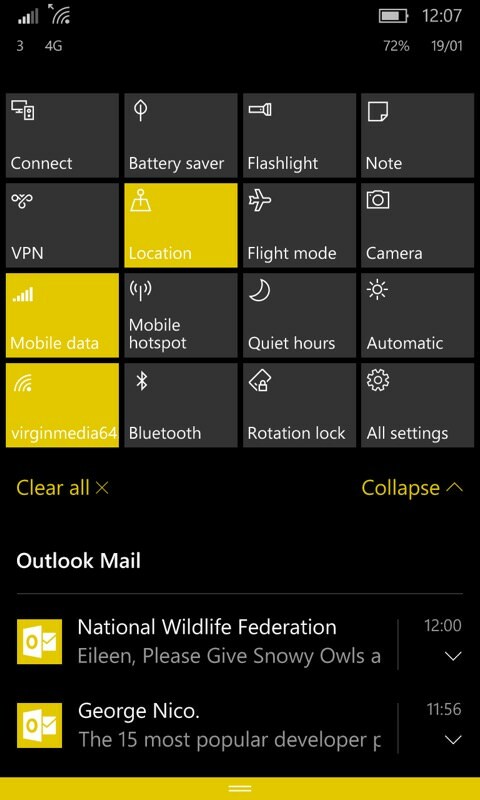 With Windows 10 Mobile 10586.63, I also think the OS is 'there' and I haven't hit any showstopping bugs now in a week. Let's hope that this - or a later build - is what gets rolled out over the air to existing handsets over the next few weeks.